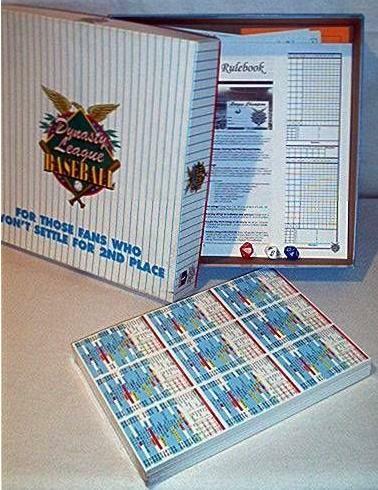 Dynasty League Baseball is the re-developed version of Pursue the Pennant from the same game designer. Like Pursue the Pennant and the Internet Baseball League Game, game play is governed by individual player cards and three ten-sided dice which are used to generate numbers from 000-999. The batter cards are numbered 000-499 and pitcher cards 500-999. Most of the information for normal plays is contained directly on the player cards, which the remainder found on the game charts. Most of the factors of baseball are taken into account by the game. The game considers R/L splits, ballpark effects, pitcher jams, clutch ratings for batters, Hit and Run ratings, and a Deep Drive chart for possible home runs that also takes into account weather and the ballpark. 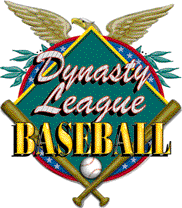 In short, Dynasty League Baseball is the most complete and realistic baseball simulation game you can buy. The only game I have found to better DLB is the Internet Baseball League Game, which you can download for free. Last update 26 April 2010. All content © tabletopbaseball.org All rights reserved.